Eurogroup meeting. May 2016. 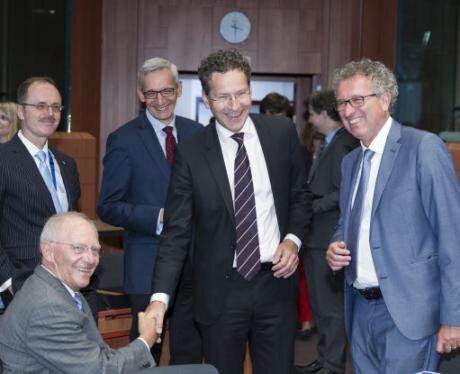 German Finance Minister Wolfgang Schaeuble is talking with the Dutch Minister of Finance, President of the Council Jeroen Dijsselbloem and the Luxembourg Minister of Finance. Thierry Monasse/Press Association. All rights reserved.In the twentieth century the Left achieved social advances through the nation state. As Pascal Lamy expressed it when he was Head of the World Trade Organisation, “Historically, the success of social democracy was to promote a compromise between labour and capital, between the state and the market and between commercial competition and social solidarity. Globalisation has unhinged the balance by taking away all the domestic levers by which we maintained the compromise” The task is to find new avenues for the social compromises that the left previously created. That is why talk about ‘building a new Britain’ or a ‘progressive economic nationalism’ (Colin Hines, Guardian letters 25 February) is so unrealistic; and why John McDonnell was unwise to speak about ‘the enormous opportunities’ of Brexit. Social democracy in one country is a non-starter in an interdependent world. With such an open economy, the UK trying to challenge international capital on its own would get nowhere. The fate that befell the Mitterrand government in France in the early 1980s should serve as a reminder to all those on the left who talk in such casual terms. The task is to find new avenues for the social compromises that the left previously created. Yet the articulation of a strategy that combines the national with the European has so far proved a step too far for all parts of the left. Over the past two decades it has been led up two cul de sacs. Firstly, for a brief moment in the 1990s with the world economy booming and the optimism of the ‘end of history’ moment, a benevolent globalization scenario seemed plausible, especially as overseen by two such fluent orators as Bill Clinton and Tony Blair. As the Panglossian Peter Mandelson described it, “Globalisation offers all the best the world can offer. We must not sound as if we believe there is a tension between labour and capital, or competition and solidarity.” Such utopian optimism and naiveté was starkly exposed by global crisis. The articulation of a strategy that combines the national with the European has so far proved a step too far for all parts of the left. But worse, by believing all issues of class to be old-fashioned, Third Way social democracy left the field wide open to others. What begun as a marketing ploy – New Labour – quickly turned its opposite – Old Labour – into a term of contempt. Blair and Brown thought the traditional working class Labour constituencies had nowhere else to go and so they left the field free to the nationalist, populist and racist Right to exploit the grievances of older working class communities and those left behind by globalisation. The adoption of Blairite approaches elsewhere combined with the collapse of the Communist parties in France and Italy has had the same result throughout. As the free movement of labour across Europe meant increased competition for manual labouring jobs and renewed pressure on housing, social and health services, the neo-liberal operation of the Single Market became a growing issue that the nationalist Right has been able to exploit. The adoption of Blairite approaches… combined with the collapse of the Communist parties in France and Italy has had the same result. Secondly, within the countries that adopted the Euro, this situation has been exacerbated by German ‘ordo-liberalism’ – the mind-set that has hegemonised the European economic policy debate. The ideological and budgetary straitjacket of ordo-liberalism was enshrined in the Maastricht Treaty and its consequences were revealed during the financial crisis with disastrous political results for social democratic parties across Europe. They have sleepwalked into disaster. Scared to embrace Keynesian economics, these parties have colluded with austerity. As a consequence, social democracy has disappeared as a force in Poland and Hungary where they followed these orthodoxies; been butchered in Spain, massacred in Greece and has been stagnating elsewhere across Europe. The policy has been absolutely lethal to the EU’s reputation for displaying competence and delivering economic prosperity. Yet this is the philosophy that currently pervades all the key EU institutions and policy-makers. And it still retains its grip on key parts of European social democracy. The historic question is whether European social democrats have the wit and energy to break from this straitjacket and work together with others to construct an alternative scenario for Europe. The historic question is whether European social democrats have the wit and energy to break from this straitjacket and work together with others to construct an alternative scenario for Europe. This is a task that requires the alignment and engagement of those far beyond the traditional forces of the Left and progressive movement. OpenDemocracy readers in the UK should be clear that this crisis is not a private affair of those within the Eurozone: it directly affects all those parties and movements wanting to shape Europe in a progressive direction. Eurogroup meeting. December 2015. 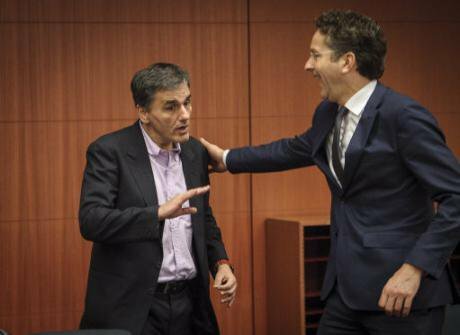 Greek Finance Minister Euklid Tsakalotos and Eurogroup President Dutch Finance Minister Jeroen Dijsselbloem. Wiktor Dabkowski/Press Association. All rights reserved. Yet this transformation cannot occur in a twentieth century fashion. The world has moved on. How? Firstly, the developed world is more fragmented socially: technological change and automation has taken its toll of the industrial working class, one could even say it has dug its grave. The concentration of capital has continued but is now accompanied by the dispersal of labour. Workers in the pits, shipyards, steel plants and engineering factories no longer have the numerical and social weight to be the self-defining core of the labour and progressive movement. Secondly, the reality of climate change and the environmental crisis means that green development has to be a signature tune of any twenty-first century progressive movement. That demands a new approach to the use of resources, with policies that establish a new relationship with nature as a priority. Thirdly, gender and race will play a far greater role in progressive politics. The contraceptive revolution has transformed the life choices of women and the demands of an equality agenda in economic, social and cultural life will grow. Francois Fillon and Jarosław Kaczyński may try to turn the clock back but the moves for equality at work, in relationships and wider cultural life, go with the historic grain. The same applies on race. Newcomers have settled in Europe’s cities from all corners of the globe. They, their children and now in many cases their grandchildren are making their lives here. Despite the efforts of Farage, Le Pen and Wilders there is no going back. Yet how to successfully weave issues of gender and race into traditional class-based narratives remains unclear. Despite the efforts of Farage, Le Pen and Wilders there is no going back. Fourthly, the ICT revolution means that the previous top-down, hierarchical structures are tarnished in the eyes of many citizens. A naive eulogy to ‘bottom-up’ or ‘the grassroots’ is inadequate. Rather, there needs to be recognition of the inter-dependence of power between the different spheres of government – neighbourhood, city, regional, national and European – and a concomitant devolution and autonomy of governmental power. Complementary to this, there needs to be a far greater decentralisation of power and responsibility within organisations. To give one example, Scottish Labour can no longer be a ‘branch office’ of UK Labour. Finally, underpinning these changes is the reality that in Europe, economics has leapt the boundary of the nation state. The optimal economic area is now continental in scale. Perhaps Japan is a partial exception. In small and medium-sized states, all the main production processes rely on integrated supply chains operating across borders. On a recent 30 minute trip along the M6 in the Midlands I passed lorries from Belgium, the Czech Republic, Germany, France, Netherlands, Poland and Spain, the physical reality of cross-European supply chains and integrated production – now threatened by the UK’s removal from the Single Market. Hence the need argued in these articles for the UK and Europe to retain a close working relationship. More than this, only a concerted attempt to combine the national and the European in a new way will be able to create a social Europe rather than an austerity Europe. Complementary to this, there needs to be a far greater decentralisation of power and responsibility within organisations. These five changes indicate why progressive politics is struggling to adapt to the scale of the transformation that is needed. At one level this is about developing new policies. When Benoit Hamon suggested taxing robots he was dismissed as a crank, yet less than a week later Bill Gates was repeating the idea. However, to focus primarily on policies is to make the mistake of many of Jeremy Corbyn’s supporters. The more profound and urgent issue is how to bring together a diverse range of forces in a new alliance. The declining role of the working class does not mean that you ignore it or deride it as ‘Old Labour.’ But rather how do you tell a story that brings working class communities in older industrial areas together with those working on their own, or in newer sectors of the economy and in the larger cities. And that requires a range of political skills and competences that understands both the strategic and the tactical; how to gain new allies and divide opponents. This combination of relevant policies; an appreciation of the importance of alliances; and the political and tactical acumen to develop and sustain them is more important than ever for twenty first century progressive politics. The issue is not to be distracted by calls from Tony Blair for a second referendum. In the UK, Brexit is the immediate test. The issue is not to be distracted by calls from Tony Blair for a second referendum. The key issue is to retain access to the Single Market. These articles have shown how that is a perfectly feasible option within the terms of the existing European Treaties. A shrewd leadership focused on this aim would be able to split major sections of the business and financial community from the Conservative Party and the tabloid press. But to do so, it would need not to fear making friends with the CBI and sharing platforms with John Major. The Trump insurgency and its European acolytes are sharp reminders of the need to create broad popular fronts and cross-class, cross-party alliances. Campaigning for the retention of the UK within the Single Market is the place to start. The head of the Eurogroup Jeroen Dijesselbloem is a Dutch Labour Party minister, at least until the March 2017 Dutch general election, while German Vice Chancellor Sigmar Gabriel when leader of his country’s Social Democrats expressed fiercer hostility to the Tsipras government than Angela Merkel in June and July 2015.